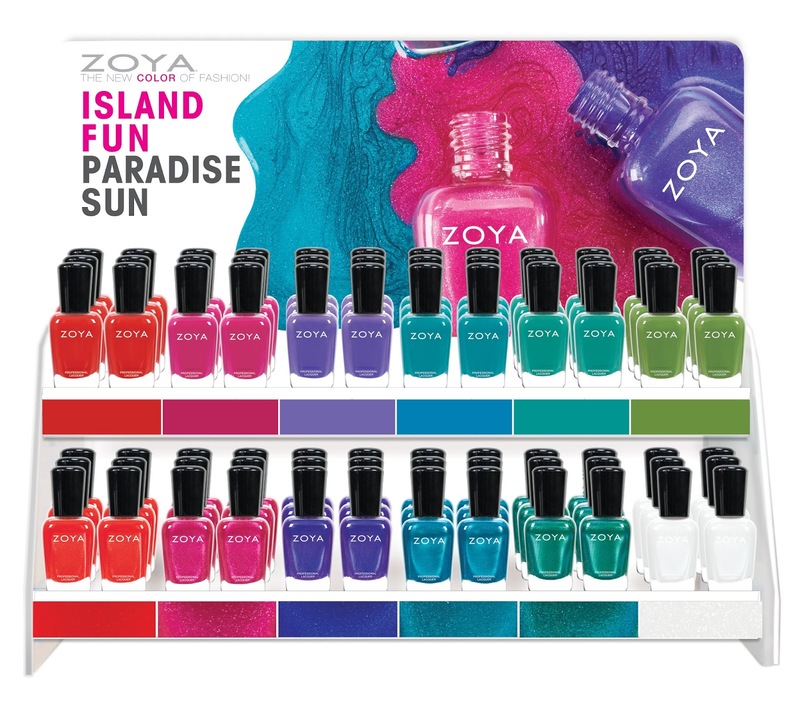 Introducing two new Zoya Nail Polish collections for Summer 2015, Island Fun & Paradise Sun. All in the Big5Free* formulaZoya is famous for. Ready for an island vacation, these playful creams embody a tropical getaway! They are strong in color to balance thebrilliance of the summer sun, with a flawless cream formula. • Jace (ZP796) - Modern tropical green in a full coverage and densely pigmented cream formula. A green that is more muted than lime and surprisingly wearable! • Cecilia (ZP797) - Classic teal in a full coverage and densely pigmented cream formula. • Talia (ZP798) - True turquoise in full coverage and densely pigmented cream formula. • Serenity (ZP799) - Summer purple in a full coverage and densely pigmented cream formula. Reminiscent of beautiful blooming irises, a harbinger of summer! • Nana (ZP800) - Deep summer fuchsia in a full coverage and densely pigmented cream formula. • Demetria (ZP801) - A vibrant poppy red in a full coverage and densely pigmented cream formula. Fully saturated with a gorgeous micronized metallic sheen, these shimmering beauties are much like sunshine sparkling onwater. Meant to be used as an independent color, these shades feature a full-coverage, densely pigmented formula. • Genesis (ZP790) - Crystalline white with a micronized metallic pearl finish. Designed to look like micro-fine diamond dust! • Oceane (ZP792) - True turquoise with a micronized metallic pearl finish that reflects the clearest blue ocean waters. • Isa (ZP793) - Deep blue-based purple with a micronized metallic pearl finish and an aqua flash that embodies the beauty of exotic island flowers. • Mae (ZP794) - Warm magenta pink with a micronized metallic pearl finish, reminiscent of vibrant Mediterranean flowers. • Aphrodite (ZP795) - Vibrant summer red with a micronized pearl metallic finish and multi-hued flash that brings it to life. AVAILABLE 05/05/15!ZOYA IS THE HEALTHY COLOR OF FASHION! Watch LIVE as Zoya Nail Polish debuts the NEW Summer 2015 Collections – Island Fun & Paradise Sun on Periscope! Join us on Friday May 1st at 12:30pm EST to meet the collection and talk with Zoya Creative Director, Rebecca Isa, on how the new shades blend with summer cosmetic and fashion trends. If you don’t have a Periscopeaccount already, don’t forget to get it set up now! UPDATE: Click HERE for Island Fun nail art & HERE for Paradise Sun nail art. Me either. I need those cremés. Aren't they? The cremés are my favorite.